Margaret was the daughter of Edward, an Anglo-Saxon prince and Agatha, a German princess. She spent her childhood at the Hungarian and English royal courts, where she enjoyed the luxuries of court life, but also received a religious education and had wanted to become a nun. After fleeing with her family from the Norman conquerors, Margaret took refuge in Scotland . We know that her boat sheltered in the Firth of Forth and Margaret supposedly landed at St Margaret’s Hope, North Queensferry. She met Malcolm, King of the Scots, whom she probably knew already from the English court, and was persuaded to marry him in 1070. So began her association with Dunfermline. Following her marriage, Margaret became a mother to her people, an educator, a social reformer and a spiritual inspiration. To her King she could do no wrong, and he lovingly supported her in all her work. Dunfermline still echoes to Margaret’s footsteps. She became a saint, and her influence and story can still be traced in many places around the town. Margaret is also remembered across the world in the names of schools, hospitals and churches. 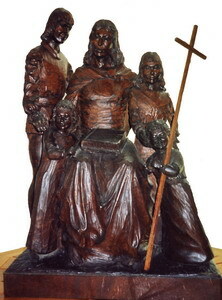 The wooden sculpture of St Margaret and her children at the head of this page was carved in Orkney and transported to Rosyth on board HMS Orkney in about 1986/7. After its time in St Margaret’s Rosyth it went to the Naval Church at Faslane, also dedicated to St Margaret. At our 40th anniversary service, Bishop Michael told us that the sculpture is now in the chapel of St Margaret’s Hospice in Yeovil, and that her image is now the logo for hospice care in the South-West of England.